No. I think you're trying to back me into a corner by getting me to commit to saying it was "X". That's wrong. What I am confident of is I can reliably eliminate every known, rational explanation. That seemingly means it comes from that long list of things which can't be true. Guess we're wrong about at least one. I'm not in a position to say what it WAS, only what it WAS NOT. I was not intentionally trying to do that so I apologize if it came off that way. Guess it's impossible to say what you saw. Who knows what is actually possible as there are people out there who see big monkeys, werewolves, massive flying birds, aliens, etc. Sounds like a smilodon or dire wolf. I cannot imagine what would happen if either were found to still exists. Especially considering the amount of game it would take to keep a breeding population alive. Have a friend who has a copy of this photo that was submitted to him, but can't show as he doesn't have the person's permission to do so. This person has never gotten back to him for what ever reason. 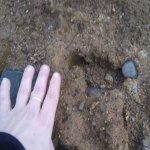 I was able to see this photo on his laptop a few years ago, and what I saw was totally unlike a Bigfoot even though this thing was massive. It was taken up around the Mt Rose area outside of Reno Nevada. This thing was a tall bipedal, and had a large head that looked like a over sized wolf's head. When seeing this thing, I told myself I would not want to be anywhere near this thing, I would rather be near a Bigfoot then this thing. I would have to say that it would rip someone apart easily and have them for a meal. I wish he would just show it to the public since the person never got back to him. Here's a really great photo and nobody gets to see it. That Bigfoot researcher Bear, or what ever his name is who has been on talk shows has a photo of a similar creature and can't show as he doesn't have permission, go figure! Glad you up graded to a 22 pistol (454) from a BB gun (357). I have something in between and it feels like I have a BB gun. O, we got plenty of game. The deer population is out of control. Trip over a dead one just about every hike these days. I'm not bored with seeing lots of grizzlies, wolves, whales, and even caribou. In fact, I don't really want to see monstrous predators that I might have to shoot. Bears are scary enough. I would have enjoyed seeing the pleistocene mega fauna! With warhammer by my side of course! The N American herds put the current African wildlife vistas to shame. That is, the N American total count easily outnumbered the vast herds found in present day Africa. MindSquatch, when was this? Was it a dogman? I've been around that area many, many times. I'm intrigued. I also find megafauna fascinating. Have a friend who has a copy of this photo that was submitted to him, but can't show as he doesn't have the person's permission to do so. From what I saw, it appears to be one! Didn't know what a dogman was back then. Not sure when the photo was taken, he might of told me but don't remember. That would be an awesome way to raise funds for the forum, never thought of that! If I get a great photo or video of Sasquatch, I'll will donate it to the premium site to help raise funds, but I would want a lifetime membership in exchange as I'm on a tight budget. Oh, I dunno. If "fear" is supposed to be the motivation, maybe agree, but I've made promises which I will honor 'til I die even though the person I made the promise to has long passed. It's called "honor" or "integrity." You and me both! "Warhammer" ... and a couple good fishing rods. This is not the case farther west. I wish we shared in your "problem". Obtaining a tag in a "good" varies from almost certain to less than once in 10 years because of the balance of hunter demand and game scarcity. That's a problematical question for many things. The same "dodge" may fit essentially all such situations, but if it does, it also presents a topic for serious study which gets even more ridicule than bigfoot right now.